This kit features a K04-001 Turbocharger, the Kinetic Hi-Flow 1.8T Manifold which are a direct bolt-on upgrade for your MKIV 1.8T Golf or Jetta. Also included is the Kinetic MKIV 1.8T Intercooler kit which features a high density intercooler core, Stainless Steel Tubing, 4-Ply Silicone Hose and Stainless Steel T-Bolt Clamps. 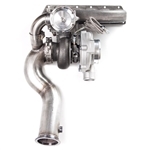 Applications: Turbo Hardware Kit for the MKIV 1.8T Golf and Jetta (99.5-05). GT3076R Turbo Kit for MK4 R32. GT3076R (500HP capable) or GT3528R (600HP capable), 44mm Tial Wastegate, 3" stainless downpipe, steel braided lines, and all hardware is included. ** NOTE charge pipe (hot side) and intake plumbing (cold side) is not included ** GT3076R Turbo Kit for 2002 (and newer) GTI and GLI (FWD models) equipped with the 24V VR6 Engine. GT3076R (500HP capable) or GT3528R (600HP capable), 44mm Tial Wastegate, 3" stainless downpipe, steel braided lines, and all hardware is included. The Stage1 VR6 Turbo Kit is sure to satisfy the need for speed in just about any driver. We have dynoed this kit at 245WHP on a stock motor with 94 octane fuel and a 3" cat-back exhaust (no cat). *The MKIII VR6 turbo kits now come stock with a 3" Stainless Steel Downpipe. - Bosch Diverter Valve The Stage2 VR6 Turbo Kit is sure to satisfy the need for speed in just about any driver. - Bosch Diverter Valve The Stage3 VR6 Turbo Kit is sure to satisfy the need for speed in just about any driver. This kit is specifically designed for the OBD2 Coil Pack ignition system. Note: we recommend a walbro 255lph inline fuel pump with this kit. The Stage 4 VR6 Turbo Kit is sure to satisfy the need for speed in just about any driver. This kit is specifically designed for the OBD2 Coil Pack ignition system. If you are looking at making 400whp + this kit is for you.